The New Jersey Department of Transportation (NJDOT) is slated to begin milling and paving on Brace Road, between Haddonfield-Berlin Road and Route 70, late next week, weather-permitting. Crews are tentatively expected to start work on Wednesday or Thursday, according to the DOT. An official work schedule is not yet available, but updates will be posted on the Township website as soon as information is available. Last Sunday, more than 100 Cherry Hill seniors came together at the Holiday Inn to enjoy an afternoon of lively, festive entertainment and delicious food at our annual Senior Citizen Holiday Party, hosted by the Township's Recreation Department. Council President David Fleisher and Council members Jim Bannar and Susan Shin Angulo were in attendance to greet guests, who were treated to a mix of show tunes and holiday favorites throughout the four-hour event. Singer Maggie Mustico and her mix of showtunes, standards and holiday favorites did not disappoint! This year's event was sponsored by Brandywine Senior Living. For more information on upcoming programs and events for residents 55 and up, please call the Recreation Department at (856) 488-7878, or email events@chtownship.com. The Cherry Hill Police Department will participate in the statewide "Drive Sober or Get Pulled Over" drunk-driving enforcement campaign from Dec. 6 to Jan. 2 in an effort to make local roads safer, particularly through the holiday season. As part of this initiative, the Department has received a $4,400 grant from the New Jersey Division of Highway Traffic Safety. Police will conduct high-visibility patrols targeting intoxicated drivers over the next several weeks. As you celebrate the holidays this year (and any time you get behind the wheel - regardless of the season) please make safety your No. 1 priority; last year in New Jersey, 19 percent of all roadway fatalities were alcohol-related. For more information on the dangers of drinking and driving and the importance of designated driver programs, click here or here. The Department of Public Works will continue the second round of curbside leaf collection next week. The following areas are scheduled for pickup the week of Dec. 9: Cherry Hill Estates, Chestnut Place, Surrey Place, Kingston, Knollwood, Cherry Downs, Northwoods, Surrey Place East, Short Hills, and Springbrook. Please avoid parking cars in the street on scheduled leaf-collection dates, and be sure to remove branches, twigs and other debris from leaf piles to ensure they can be collected. For more information, please call DPW at (856) 424-4422. The Teen Scene program, which was developed collaboratively between Cherry Hill Township and students at Cherry Hill High School West, has received national recognition with a "Promising Practices" award from the Character Education Partnership. Teen Scene is a fun and engaging program that brings together Cherry Hill teens with special needs and their typically developing peers. Click here to read more about the award. The next Teen Scene event, a holiday party featuring Cherry Hill West's Men of Note, will take place at 6:30 p.m. next Friday, Dec. 13, in the Carman Tilelli Community Center. Teen Scene is open only to high-school age Cherry Hill residents. For more information, call (856) 488-7868, or email Ombudsman@chtownship.com. 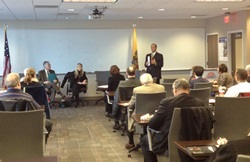 On Wednesday morning, a few dozen members of the Township's Business Council met at the offices of Farmers Insurance, 951 Haddonfield Road, to discuss a number of items, including recent events and new business openings - and to talk about opportunities for giving this holiday season. It was, as always, a lively and productive meeting, and I look forward to seeing what we can accomplish as a group in the year ahead. As we approach the end of my second year as Mayor, I'd like to invite others to apply to join both the Business Council and my Citizens Cabinet - two groups that act as ambassadors between Town Hall and the community we serve. For more information on these organizations, or to apply, please contact Donna Dovey at ddovey@chtownship.com, or call (856) 488-7878. Cherry Hill Township will host a Red Cross Blood Drive from 11 a.m. to 4 p.m. Wednesday, Dec. 18, in the Carman Tilelli Community Center, 820 Mercer St. Make your appointment now, and give blood to help save a life this holiday season. Click here to register online; for donor guidelines and eligibility requirements, click here. This week, I'd like to spotlight one of our area's oldest automotive services. Russ Stackhouse opened his auto service business in Delaware Township in 1928, and with the exception of a brief stint in Westmont, Russ' Auto Service has been located in its current location at 25 Berlin Road for the last 52 years. Russ' is operated today by Stackhouse's grandson, Glenn Garwood Jr. A great history of Russ' can be found here. Each of the businesses we've highlighted in the past few weeks has become a living piece of Cherry Hill’s history, and I’m honored to be able to recognize their longstanding investment and presence in our community. Read more about this project in the Courier-Post and the Cherry Hill Sun. If you know of a business that has been around for 50 years or more, please let us know by calling (856) 488-7878, or e-mailing me at MayorCahn@chtownship.com. Now that school is back in session, it's an excellent time to become reacquainted with the District's weekly e-newsletter. Click here for the latest edition of the Cherry Hill School District’s e-news update, which contains news, information and events from around the district. For up-to-the-minute updates on any subject, call my office at (856) 488-7878, visit our municipal Web site at www.CherryHill-NJ.com, like us on Facebook, or follow us on Twitter (@CherryHillTwp). If you know someone who would like to receive this weekly briefing, please refer them to the "notify me" section of our website. 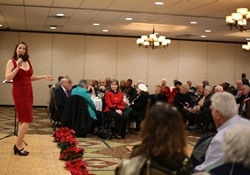 Last Sunday, more than 100 Cherry Hill seniors came together at the Holiday Inn to enjoy an afternoon of lively, festive entertainment and delicious food at our annual Senior Citizen Holiday Party, hosted by the Township's Recreation Department. Council President David Fleisher and Council members Jim Bannar and Susan Shin Angulo were in attendance to greet guests, who were treated to a mix of show tunes and holiday favorites throughout the four-hour event. Singer Maggie Mustico and her mix of showtunes, standards and holiday favorites did not disappoint! This year's event was sponsored by Brandywine Senior Living. For more information on upcoming programs and events for residents 55 and up, please call the Recreation Department at (856) 488-7878, or email events@chtownship.com [mailto:events@chtownship.com] . The Cherry Hill Police Department will participate in the statewide "Drive Sober or Get Pulled Over" drunk-driving enforcement campaign from Dec. 6 to Jan. 2 in an effort to make local roads safer, particularly through the holiday season. As part of this initiative, the Department has received a $4,400 grant from the New Jersey Division of Highway Traffic Safety. Police will conduct high-visibility patrols targeting intoxicated drivers over the next several weeks. As you celebrate the holidays this year (and any time you get behind the wheel - regardless of the season) please make safety your No. 1 priority; last year in New Jersey, 19 percent of all roadway fatalities were alcohol-related. For more information on the dangers of drinking and driving and the importance of designated driver programs, click here [http://www.nj.gov/oag/hts/index.html] or here [http://www.madd.org/] . residents. For more information, call (856) 488-7868, or email Ombudsman@chtownship.com [mailto:Ombudsman@chtownship.com] . As we approach the end of my second year as Mayor, I'd like to invite others to apply to join both the Business Council and my Citizens Cabinet - two groups that act as ambassadors between Town Hall and the community we serve. For more information on these organizations, or to apply, please contact Donna Dovey at ddovey@chtownship.com [mailto:ddovey@chtownship.com] , or call (856) 488-7878. Cherry Hill Township will host a Red Cross Blood Drive from 11 a.m. to 4 p.m. Wednesday, Dec. 18, in the Carman Tilelli Community Center, 820 Mercer St. Make your appointment now, and give blood to help save a life this holiday season. Click here [http://www.redcrossblood.org/make-donation-sponsor?date%5Bmin%5D%5Bdate%5D=&date%5Bmax%5D%5Bdate%5D=&field_sponsor_code_value=Cherry%20Hill%20Township] to register online; for donor guidelines and eligibility requirements, click here [http://www.redcrossblood.org/donating-blood/eligibility-requirements] . 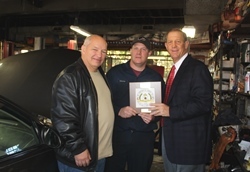 This week, I'd like to spotlight one of our area's oldest automotive services. Russ Stackhouse opened his auto service business in Delaware Township in 1928, and with the exception of a brief stint in Westmont, Russ' Auto Service has been located in its current location at 25 Berlin Road for the last 52 years. Russ' is operated today by Stackhouse's grandson, Glenn Garwood Jr. A great history of Russ' can be found here [http://www.russautoservice.com/about-us/] . Each of the businesses we've highlighted in the past few weeks has become a living piece of Cherry Hill’s history, and I’m honored to be able to recognize their longstanding investment and presence in our community. Read more about this project in the Courier-Post [http://www.courierpostonline.com/article/20131114/BUSINESS20/311140020/Cherry-Hill-honors-businesses-town-50-years] and the Cherry Hill Sun [http://sj.sunne.ws/2013/11/26/cherry-hill-honors-longstanding-businesses-of-50-or-more-years/] . If you know of a business that has been around for 50 years or more, please let us know by calling (856) 488-7878, or e-mailing me at MayorCahn@chtownship.com [mailto:MayorCahn@chtownship.com] . Now that school is back in session, it's an excellent time to become reacquainted with the District's weekly e-newsletter. Click here [http://www.cherryhill.k12.nj.us/news/news/enews.cfm] for the latest edition of the Cherry Hill School District’s e-news update, which contains news, information and events from around the district. For up-to-the-minute updates on any subject, call my office at (856) 488-7878, visit our municipal Web site at www.CherryHill-NJ.com [http://www.cherryhill-nj.com/] , like us on Facebook, or follow us on Twitter (@CherryHillTwp). If you know someone who would like to receive this weekly briefing, please refer them to the "notify me" section of our website.